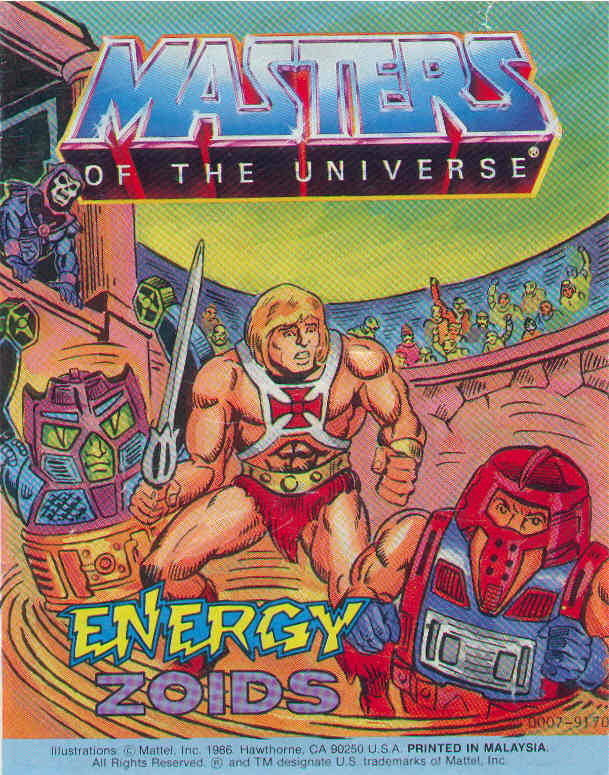 Energy Zoids is a 1986 Masters of the Universe mini-comic written by Phil White and illustrated by Chris Carlson. Here, Skeletor and the Snake Men try to steal Man-At-Arms’ new robot-warrior-creating invention. I always thought Rotar and Twistoid were fairly lame toys, but White does a good job of giving Rotar a little bit of character (and hoist the flag, I guess, for empowering amputees). It’s also cool that Skeletor’s running an underground fight club out of Snake Mountain. I’ve missed that since Clash of Arms. The ending is a little too He-Man ex machina, but they had to get him into the story somehow (and the teamwork moral at the end veers a little too close to “never try to win without getting help from He-Man” territory). Carlson does a good job with the characters and action, although his heads are frequently oversized and lumpy. But why, longtime colorist Charles Simpson, is Skeletor’s Havoc Staff orange? White does a fair job given what he has to work with, and despite its flaws, this one is perfectly readable.